After seeing Yuzuru Hanyu at 2012 Worlds it was very clear for everybody that the kid would have done something special in the future. I just didn't expect it to happen so soon. 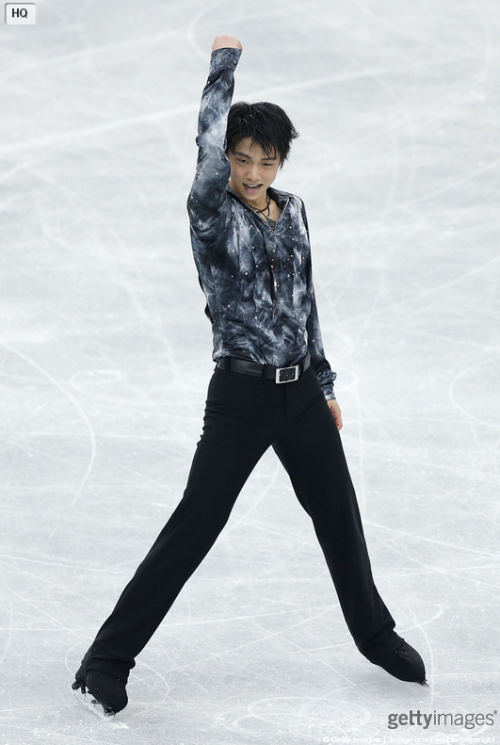 The Japanese skater is just 17 but already medaled at words at his debut last year. After that amazing result, under the coaching of Brian Orser, Yuzuru started the season better than always scoring a world record at the very first grand prix of the season. And that was not a fluke, because at NHK Trophy he was able to top the previous world record with 95,32 in front of the home crowd. I remember Brian Orser being interviewed before the 2010 Olympics about who he tought would have been the favourite for the gold in the men event. In the "quad or not quad" debate, he answered Stephane Lambiel because he had both quad and artistry. But then Evan Lysacek won without that difficult jump and for this men's figure skating has changed so much that now the bar is not "the quad" anymore, but "how many quads". Yuzuru is one of those who have a pretty consistent quad toe in the short program (nailed it both at Skate America and NHK Trophy). As others, he decided it to be his solo jump. The solo jump needs to be preceeded by steps, which is a very hard job if you are doing a quad after those steps. Some of the skaters don't even attempt them and that costs them points on the goe. This is not his case, since he does some steps before his toe (not actually very difficult steps but enough for getting +2 or +3 on a well executed jump). As some have said, that score of 95.07 was the result of the introduction of the new rule for that you receive a bonus for jumps executed in the second half of the short program. Indeed he placed both his triple axel and the triple lutz-triple toe combo in the second half getting two more points overall on the base value of the jumps (last year the base value of triple axel plus triple lutz-triple toe combo was 18.60, while this year is 20.46 with the bonus). He is very solid on both jumping passes and his triple axel is outstanding everytime. In last year's free skate he did the axel directly taken from a spread eagle and I have actually the feeling that he could do anything before and still land it. In the short he has a very difficult transition going in, with several steps and a final left outside to inside edge counter turn as the entrance of the axel. His triple-triple combo is always easy and perfectly executed. Yuzuru got a level four for any spin he does in his short program (at Skate America got a level three in the sit spin). Flying Camel spin: the camel spin is always very hard for a man, because the natural lack of flexibility does not allow difficult position but since Yuzuru is very young compared to others, he can still count on a good stretch and a donut position. As for steps Yuzuru haven't received a level four yet, but since he got it in the previous seasons, he just needs to refine a little bit the footwork. Because it is his last jump, and he was tired towards the end of the program.